Not so long ago, learner bikes were perceived as nondescript, you weren’t part of the club as a newbie. Low-capacity bikes – by which we mean sub-500cc – were shrugged-off by mainstream bikers. I vividly remember being ignored by other riders while I had L-plates. But today the image of low-capacity bikes has changed dramatically. So much so that you don’t need the excuse of being on a restricted licence to appreciate these bikes. These bikes prove you can have a lot of fun with less than 42bhp and they’re all pretty affordable too. Making its debut in showrooms this year, the Ducati looks the part, but Justin did point out that “after a while you realise it’s not the real deal, like a budget version of the real thing”. For example, the rear number plate is hung from underneath the pillion seat and isn’t the nicely fitted floating unit that hugs the bigger Scrambler’s rear tyre. But you still get the same round dash, which is slightly offset to the right. The dash is the most attractive of the bikes on test and the only one which can be scrolled through remotely from the bar. 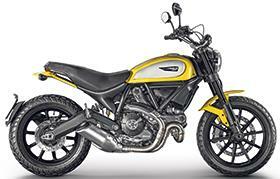 The wide Scrambler bars remain, as do the familiar styling and graphics. But before you all fall in love with the Ducati, it’s worth pointing out the price. Yes it’s the cheapest new-bike way into the Ducati brand but it’ll still bother your wallet for £6450, that’s £2000 more than the competition. 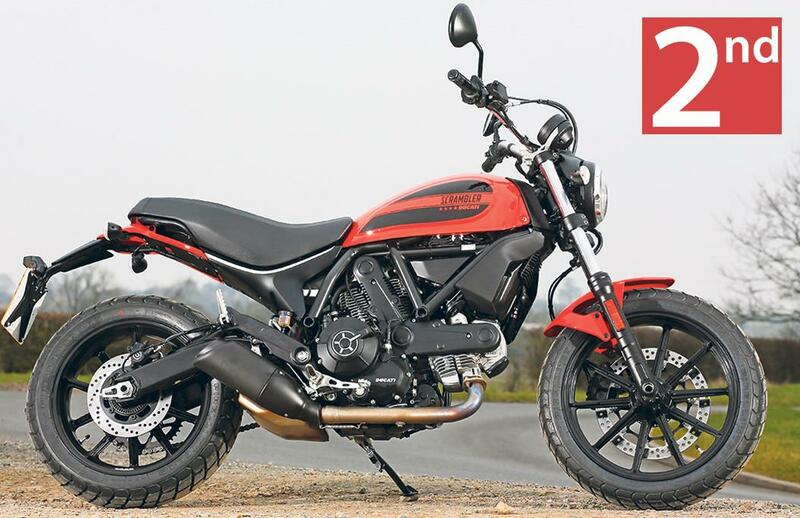 What’s more, it’s less than a grand cheaper that the 803cc Scrambler. However you choose to look at it, that still feels like a dip in value for money. But should you step up? Each bike has a bigger brother, all of which can be restricted to A2 compatibility – but are they worth the extra? 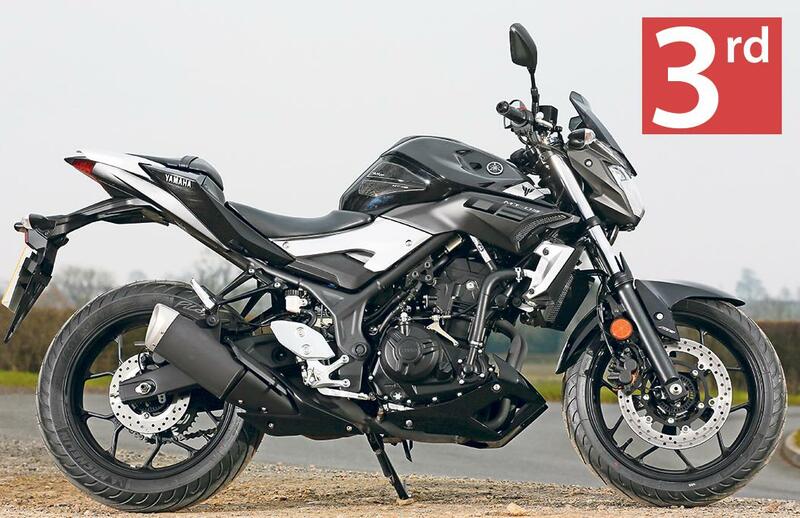 The steps between each model are wildly different in price and spec, but if your A2 bike is a stepping stone, each one of these also mean you’ve already got your second bike – simply derestrict it when your licence allows. It’s a phenomenally close relative of the Sixty2, but boasts an 803cc engine, and higher quality cycle parts. Well worth the extra £850. This is a very different beast to the 390, offering not just a bigger alternative, but a completely different proposition. Still one of the best value machines ever built, this is a really serious option. It’s a lot of fun-packed bike for the money. Like the 690 Duke, this is a radical step up. Physically much more imposing, this is much more than a capacity increase. So what about the rivals? 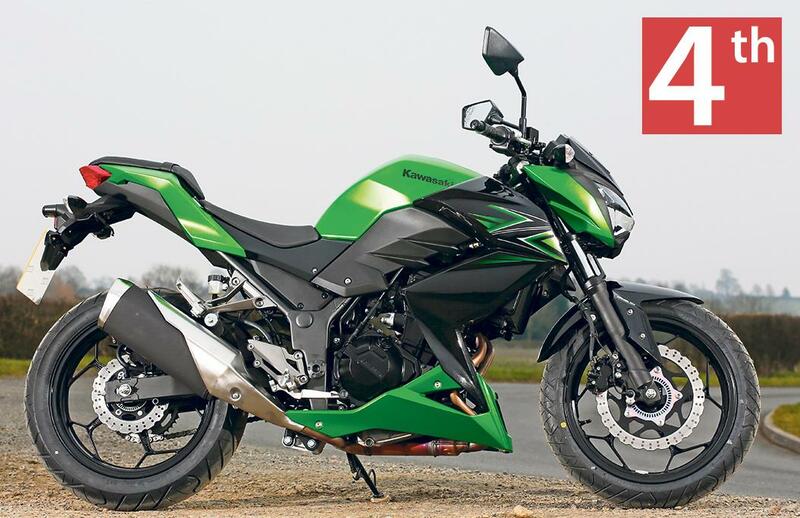 The Z300 is clearly part of the Kawasaki family; you couldn’t mistake it for anything else. 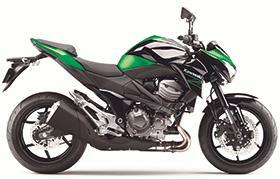 Its aggressive, wide bodywork isn’t dissimilar from the Z800, the clocks are neat and have a user-friendly gear position indicator. Despite the Kawasaki not actually being made in Japan, the build quality is still impressive considering the price. It feels solid and well put together, just like its larger capacity stablemates. It’s physically slightly smaller than the Yamaha, but has a secure feeling about it, whereas the Yamaha feels less substantial. We all left a little short-changed by the Yamaha. It doesn’t feel like it came out of the Yamaha factory, and you can tell it’s been built to a tight budget. Nobody liked the view from the cockpit, the silver bars appear cheap and the whole effect feels devoid of the firm’s usual care. The graphics on the side reading ‘dark side of Japan’ are a little cheesy for our mature group too. The bodywork feels flimsy, especially the rear around the grab rails and, as much as we tried to find its good side, nobody warmed to the looks of the MT-03. And that headlight looks like an afterthought, the type you’d have bought in the late 90s to get your crashed GSX-R600 back on the road. Amidst such a stylish family of MT models, it seems three is not the magic number. 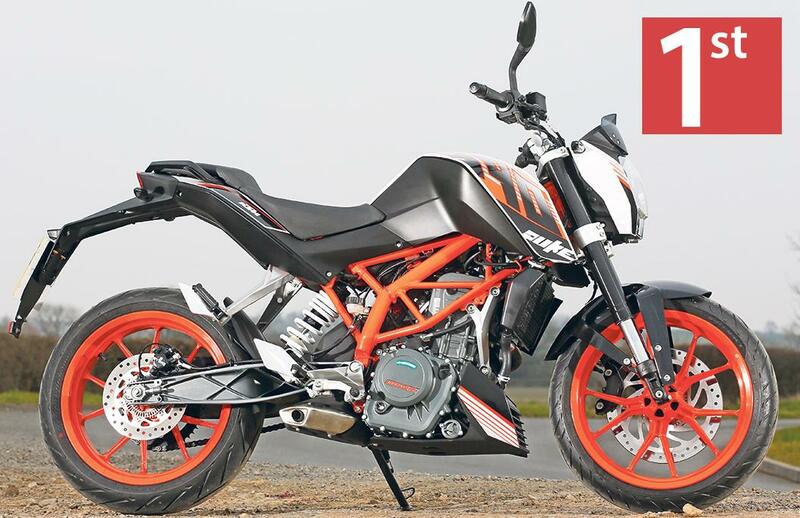 The KTM may be built in India, but you’d never guess it wasn’t put together in the Austrian HQ. While telltale signs, like the Bybre brakes (Brembo’s small bike brakes division. By Brembo, get it?) are an easy clue, the build quality and finish are impressive at this price. The only downside is the dash, which is perfectly functional but not the most attractive. The styling is obviously aimed at those with selfie sticks rather than walking sticks, but despite the fact I’m pushing 40 I actually rather like the bold graphics – and there’s no way you’d mistake it for anything else, it’s a KTM through-and-through. Obviously image, style and looks are important, but the bike also has to work, and these sub-500cc bike need to be versatile. This is where Ducati’s Sixty2 falls down slightly. All four have similar power in order to comply with the A2 licence laws, but it feels like the Scrambler has 10-15% less power even though it hasn’t. It feels lazy, there’s no get up and go about it. It feels like a normally aspirated diesel car; lazy. It will happily cruise along at an indicated 80mph, revving the lowest of the group while doing so, but changes in gradient have a noticeable impact on performance. The very upright riding position and lack of aerodynamics don’t help the lazy motor. Overtaking at over 60mph needs to be well planned and all part of one momentum-laden motion. You simply can’t wind on the power, as there isn’t any. The air-cooled twin is smooth, the smoothest of the bunch, there’s useable torque lower down, and it’s brilliant around town, but get it up around the national speed limit, and it’s soon running out of puff. The others aren’t much quicker, although the KTM will just edge a drag race and will easily show an indicated 100mph or more if you get tucked in. The KTM is a little lumpy lower down, as you’d expect from a single, but it is the quickest of the bunch. In fact, compared to the Ducati, the others all have more zip about them, more go, and are therefore slightly more fun. The Yamaha has the ease of use of the Ducati lower down, but slightly more power as the speed increases, and it’s really noticeable when riding them back-to-back. Even the Kawasaki has more go than the Duke despite its lack of claimed power, but boy you have rev it, all the way to 13,000rpm at times. At 80-85mph the Zed will hover around 9000-10,000rpm which sounds brutal but it appears to take it in its stride. 80mph cruising is possible on all four bikes, depending on your degree of mechanical sympathy. All four will show an indicated 100mph, although only just on the Ducati, which means that even at the motorway speed limit you have a little in reserve, but again the KTM more so than the others. 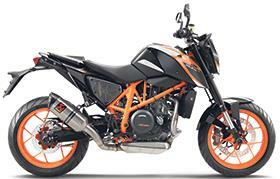 The KTM also wins the handling stakes. It’s light and nimble – 28kg lighter than the Ducati – and feels almost like a supermoto, which possibly isn’t such a surprise from KTM. The brakes are also the best of the bunch but the KTM may feel a little too radical for some – it does turn very quickly and is sporty for a low capacity bike. Strangely the Zed felt a little vague, the suspension is on the firm side, isn’t plush enough, and lacks feedback. The Yamaha has the feedback, is softer and more forgiving and more what you’d expect from an entry-level bike – but the brakes are lacking. As an all-round package the Ducati scored highly. There’s a natural balance to the Scrambler, it boosts confidence despite its old school appearance. The suspension and brakes are adequate and the Pirelli tyres are impressive in the wet or dry. The Duke may not have the power and excitement, but it certainly has the handling. The Ducati’s ease of use is a real benefit in town; the turning circle is small, it’s light and low, and the only drawback are the wide bars which can make filtering tricky. The Yamaha’s ease of use also makes it a useful town bike. Londoner Justin said he’d opt for the Yamaha for serious town work and commuting. It’s a little roomier than the rest, softer sprung and has a zippy engine – just avoid your reflection in shop windows. Towards the end of our test each bike’s qualities and personalities became more apparent, and we all grew to love the Ducati more. Most owners won’t mind the lazy motor, but we all agreed the price felt too steep. Yes you’re buying into the Ducati brand, but it’s only £900 cheaper than the Scrambler Icon, which is a much more versatile beast – and which can also be restricted to A2 licence compatability. As much as we loved the style of the new Ducati, everyone preferred the KTM to ride, especially when considering price and attitude. We all discussed what the outcome would be if the prices were equal, but even if the Ducati were £2000 cheaper, two out of our four test riders would still have opted for the KTM. If you don’t like the funky styling of the KTM and the Ducati is too pricey then the Yamaha is the next best bet, just – especially if your riding is more town focussed. 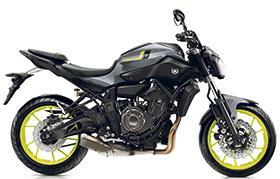 But the Yam doesn’t have the build quality, brakes or styling of the harder Kawasaki.